Universal Animal Cuts is a compound of natural fat burning supplements which are highly effective and very quick. It contains 9 formulas of high efficacy and power in burning fat. It increases fat burning, inhibits appetite, cortisol and other active ingredients that cause fat accumulation. No side effects of insomnia or hyperactivity. 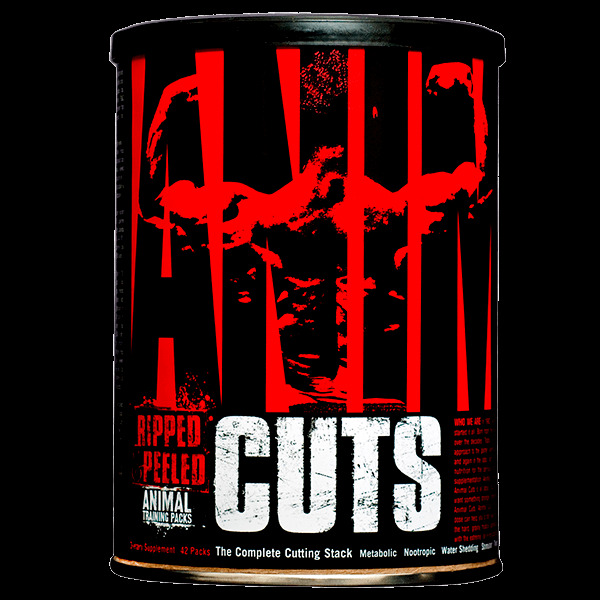 Animal Cuts of the Animal range from Universal Nutrition, is a pack of natural fat burning ingredients, which are also highly effective and very quick. Contains 9 high efficacy and powerful capsules in burning fat that fights all fronts for the removal of fat: fat burning, it suppresses the appetite, inhibits cortisol and other active ingredients that does not allow the occurrence of fat accumulation. Helps to burn fat through thermogenic and lipotropic effects. It regulates the thyroid gland, insulin levels and nervous system to lose weight effectively without side effects of insomnia or hyperactivity. Animal Cuts is one of the most popular fat-burning supplements, and the best selling in the world, used by bodybuilders and athletes of professional level. Its effectiveness is supported by multiple personalities of bodybuilding, and has been specifically designed to meet the needs of advanced bodybuilders, producing drastic changes in the physique of an athlete in a short period of time. The ingredients of this innovative formula can maximize fat oxidation by stimulating the thyroid gland, increasing thermogenesis and optimizing the diuretic effect for excellent results in weight loss. Also, the Animal Cuts’ formula incorporates appetite and cortisol suppressants as well as other active ingredients that cause fat accumulation, especially in the abdominal area. It contains the thermogenic complex Animal Cuts®, which increases body temperature to use more calories, metabolic lipotropic complex Animal Cuts® for proper assimilation and elimination of fat, Thyroid activators regulating hormone secretion to regulate weight, Nucleotide regulator to improve metabolic and energy processes, Neurotransmitters regulator to promote the health of the nervous system and metabolism boosters to help burning calories, diuretics and insulin enhancers. Increases body temperature, to maximize the caloric use of the organism. Facilitates the removal of fluids, and avoid the retention of them. "Thanks to all these properties Animal Cuts is considered the most complete and powerful fat burner in the market"
Animal Cuts stimulates lipolysis process by which stored fat is used as an energy source and speeds up the metabolism to burn calories throughout the day. In addition, its diuretic effect eliminates swelling and fluid retention to achieve a perfect definition. Animal Cuts is very simple to ingest. The 9 pills come in different colors to differentiate their effects. The only identified by the manufacturer are red, which produce thermogenic effect, and the blue ones produce diuretic effect. Thus, people who do not need any of these features, can skip taking these capsules. Recommended use: As a dietary supplement is recommended to consume throughout 3 weeks, 2 packs a day; during training days and rest. Take on fasting, at least 4, 5 hours before bedtime. This magic mixer is the same as the other mixers but with a very very better price so I recommend buying it since they are all the same.